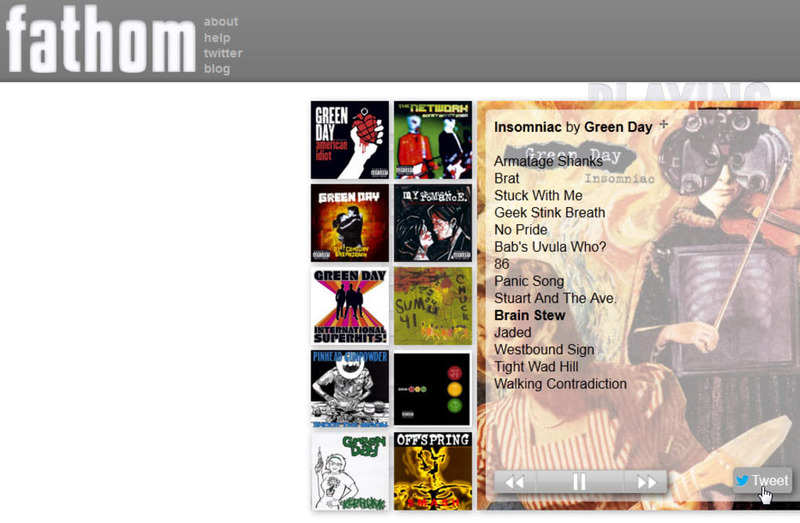 Fathom is a web app that allows you to stream music and find similar artists. By default this app is designed around finding new music that fits your tastes rather than listening to your known favorites. 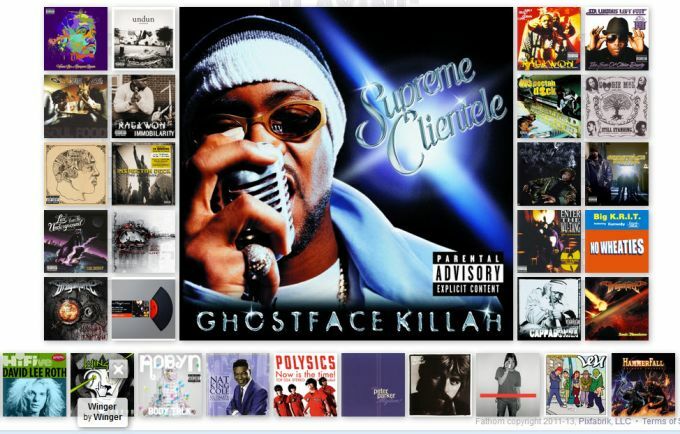 Fathom does this by pulling audio and album art from Last.fm and Rdio. While you’ll need a paid Rdio subscription to access the best of Fathom’s features, the web app is nearly complete for free. In Fathom you will be presented with a large blank screen and a search box. You can only browse by artist, not individual songs or albums. 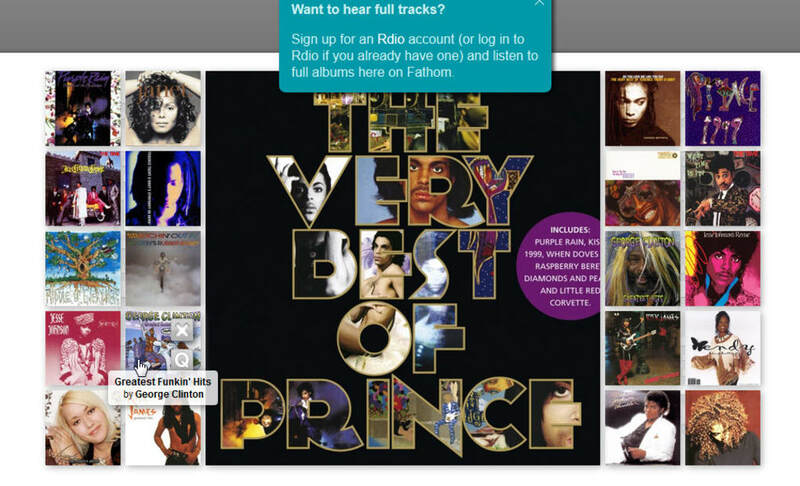 Fathom will search Rdio’s database and include the artist’s most popular album in the center of the screen. If you do not have a Rdio account you can listen to short samples of each album’s track; Rdio users can listen to entire tracks. 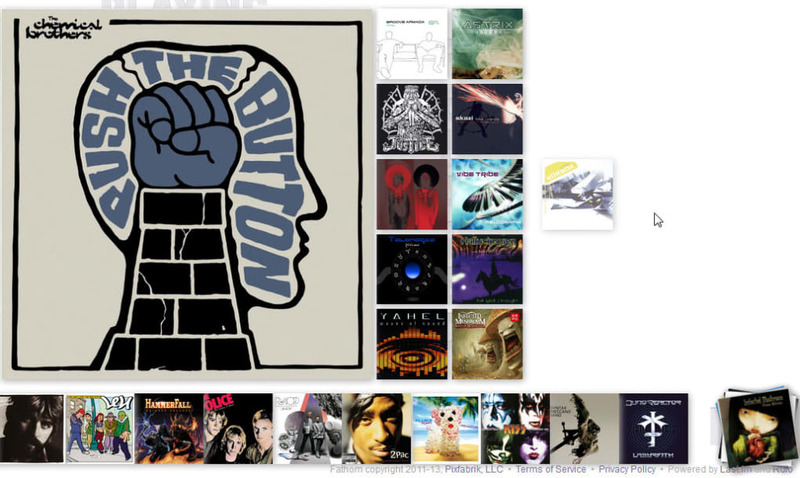 As you listen to an album Fathom will search for similar artists and fill the screen with up to twenty relevant albums. Switching to one of these new albums will bring it to the center and Fathom will start searching for more similar artists. Fathom is easy to use and understand. When using it for the first time the app will include popups to show you how it functions. Each time you fully exit out of the site and come back these popups will appear again in case you missed them. When you hover over an album additional buttons will overlay. On main albums this includes seeing the album and artist name, selecting through tracks, pausing, searching for more related artists, and even sharing to social networks such as Twitter. On related albums you can only choose to play, close, or queue them. One strange feature is that there is no volume control and the music plays at a rather loud volume. Fathom’s design is very basic with simple white and grey gradients. When you first open the app there will be clearly marked spaces for what’s playing, related, queued, and in your history. Strangely all of these headers will quickly become obscured with album art as you search for more music. All of Fathom’s art is pulled from Last.fm’s database. The unfortunate aspect is that an album has to be on both Last.fm and Rdio to show up correctly: If it is only on Last.fm an album art will load but not play; if it is on Rdio but not Last.fm no music will be found at all. Even with a large amount of cover graphics on screen Fathom generally has stable functionality. Fathom is great if you are looking for new artists that are related to musicians you enjoy. You will need a Rdio account to listen to full tracks, but even without one you can sample an array of new content. While it does have some strange design choices Fathom is still very intuitive. What do you think about Fathom? Do you recommend it? Why?